Age: Six Months; Halfway to a YEAR! 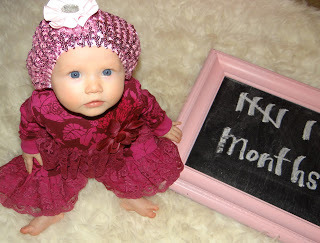 Milestones: SOOOO many … this was a huge month for our little munchkin. She finally rolled over a couple of weeks ago, and although it only happened twice, we at least now know she is capable of it. I definitely think she would do it more if she was more interested. It’s just that she has a strong, stubborn personality and doesn’t want to do anything she doesn’t want to do. (It’s cute now, but I have a feeling I’m in trouble later!!!). She will now lay on her tummy for a longer period of time and seems to like it more than she used to. 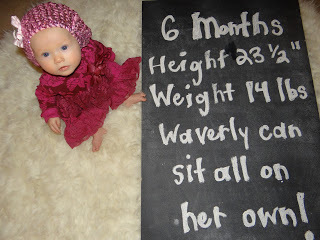 Waverly also can now sit on her own! YAY! This makes life so much easier as she will now play for longer and our photography sessions are much more effective. And it’s just so darn cute. I have also noticed that she can grab on to her toys much better, laughs more & louder, and is overall just figuring out our little world on a daily basis. Sleep: Nights at our household have definitely gotten easier since last month. I am almost nervous to write this, as I can be superstitious … but she has even slept through the night twice this week. She still sleeps in the magic sleep suit at night, but has been napping in her crib without it. Her nap schedule, at the moment, is unpredictable. She pretty much takes a nap each morning two hours after she gets up, but the afternoons are another situation. Some days she goes without one entirely and is content as can be, while others she definitely needs a long rest to be her happy self. I think she really is just so social that she doesn’t want to miss anything during the day and tries to stay up as much as possible. And for me, that’s just fine since it means more Mommy & Waverly time! Eating: Thanks to our new high chair, Waverly Maye is officially eating more than breast milk these days! So far, she has tried rice cereal, oatmeal, sweet potatoes, and avocado. The oatmeal seems to be her favorite, although I’m trying to get her more on the veggies. We are making them in our new baby bullet, which we love! I think adding in these foods have contributed to her better sleep at night, and also have helped to extend my milk supply for a longer period of time. (I am still pumping and we have yet to give her any formula; my goal is still one year!). I never realized how fun feeding our little girl would be, but it is seriously one of my favorite times of the day, and I think hers too. Favorite Moments: Um, exactly how much can I write here? There have been so many memorable & exciting moments this month that they all kind of come together as one overall (perfect) memory. What makes them that much more special is that they all have been doing habitual, everyday activities that used to be so ordinary & mundane. Like, for example, bath time? Who ever thought something so routine could be so much fun? We also love jogs in the stroller, shopping at Target with Waverly sitting in her new cart cover, and snuggling together at night. Extra Comments: I imagine that I may say this again in the months to come, but I am pretty sure that this month has been my favorite yet. Waverly is just SO fun these days, and other than her occasional fussy moments (which now can almost always be tracked to hunger or sleepiness), each moment with her is (in one word) – amazing. Next Post Happy One-Half Year, Waverly Maye! Happy 6 months pretty girl!!! Ps. I love her name!!! Oh she is so cute! Six months is a FUN age! Next time I'm totally taking maternity leave starting at six months! They're so much more fun and interactive! Mac just turned 8 months and it just keeps getting better. He's waving now! It's the cutest thing I've ever seen in my life.